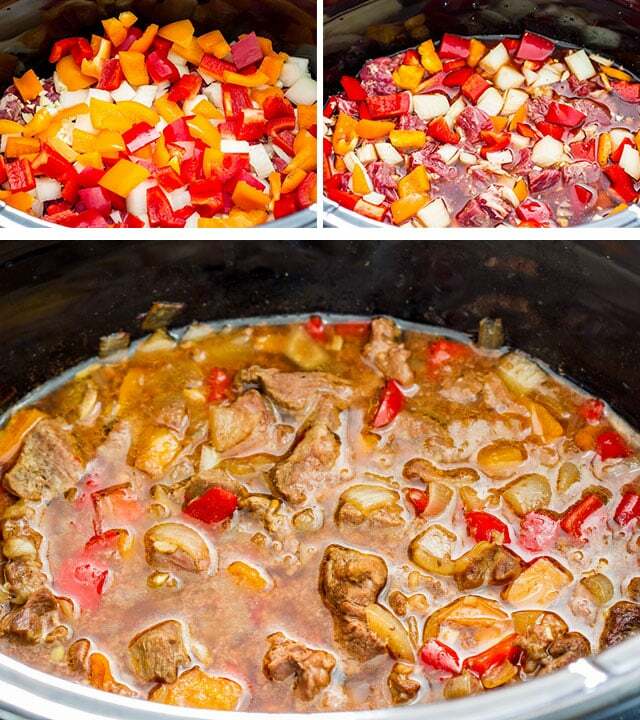 This Slow Cooker Pepper Steak is a super easy slow cooker meal, all that’s required is 10 minutes prep time to you end up with one delicious meal. Always a favorite and better than take out. Since I’ve gotten my Instant Pot, I feel like I’ve neglected my slow cooker over the past few months. Although the Instant Pot can be used as a slow cooker, I prefer to use my slow cooker because it’s bigger. 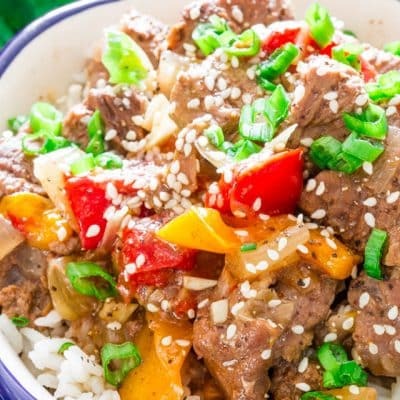 I made this delicious pepper steak Asian style dish that is to die for. Full of flavor, melt in your mouth kind of beef, simply a party in your mouth. We ate it all and we loved every little bit of it. This pepper steak recipe is as simple as it gets. Start with your beef, I used beef tenderloin here, bought a big beef tenderloin last time we went to Costco, so here’s part of it. Trim off the fat, if preferred and cut it into small pieces, about an inch each. Place that in your slow cooker. 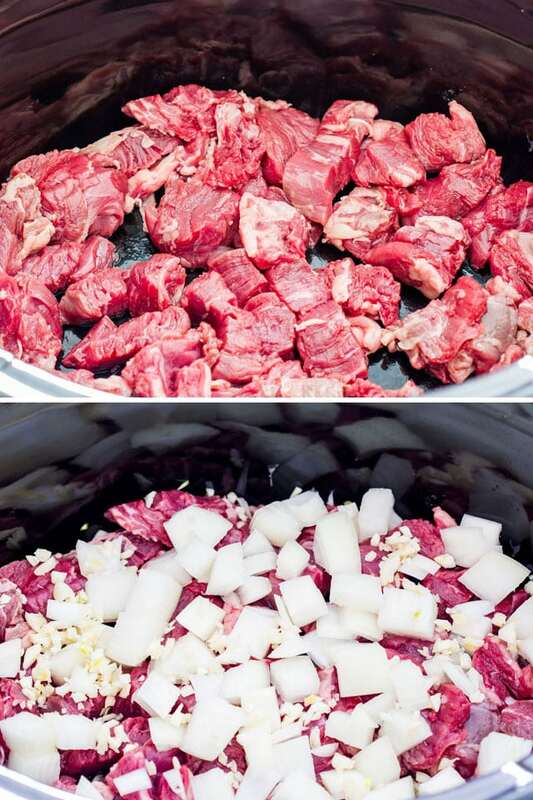 Cover it up with a roughly chopped onion and some minced garlic. You know I like my garlic, so I used lots of it. I heart garlic! Then throw in the peppers. I used two bell peppers, one red and one yellow, but a green one would have been nice too for some green color. Use whatever you have. And then the liquids, I mixed beef broth with some teriyaki sauce and some hot sauce. If you don’t have teriyaki sauce, soy sauce would be nice as well, but I strongly recommend the hot sauce, gives it that nice kick. After 5 hours on low, or 3.5 hours on high this is what you end up with. A yummy beef stew looking kinda dish. I wanted to thicken up the sauce a bit, so I took a ladle of the sauce from the slow cooker and whisked it with a tbsp of cornstarch in a small sauce pan and cooked it until it thickened, then dumped it back in the slow cooker and stirred. Up to you if you do this, you can totally skip that step. All that’s left to do now is to eat. I served it over some white basmati rice, but mashed potatoes would be nice with this too. 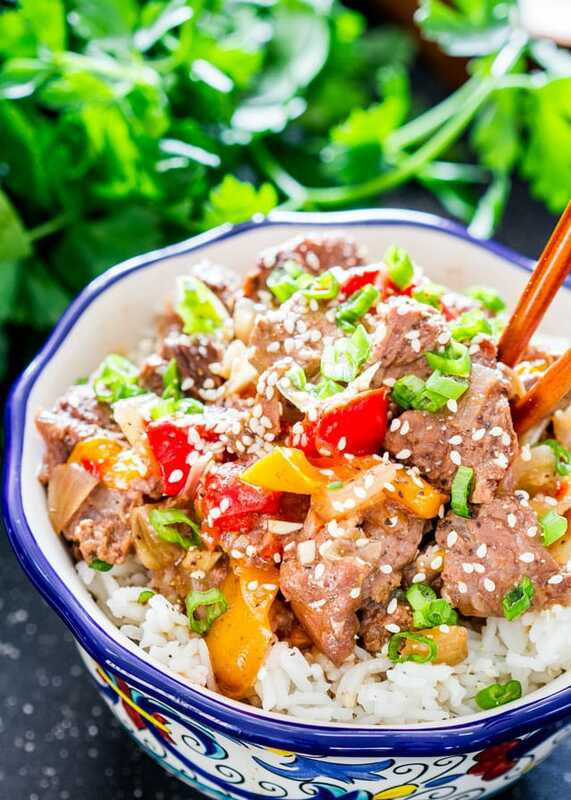 For a quick 25 minute Asian Style Pepper Steak, try this recipe. 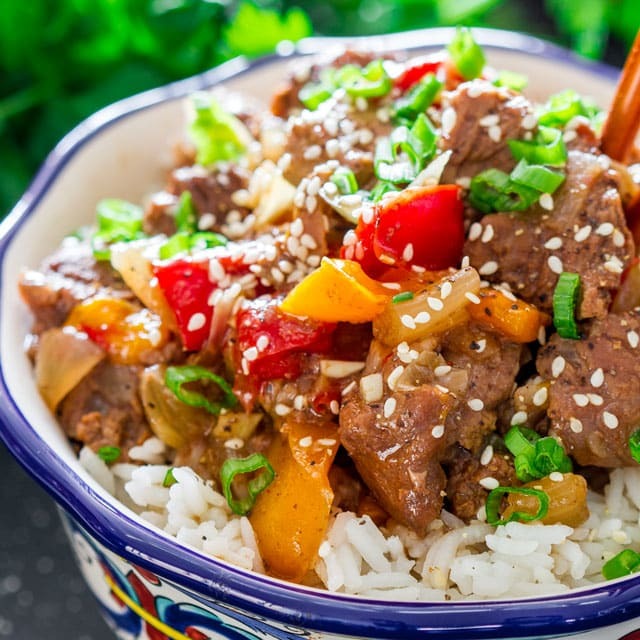 This Slow Cooker Pepper Steak is a super easy slow cooker meal, all that's required is 10 minutes prep time to you end up with one delicious meal. Always a favorite and better than take out. Trim the meat if needed and cut into small pieces. Place the meat in the slow cooker. Then throw in the rest of the ingredients and roughly stir. Cover and cook on low for 5 to 6 hours or on high for 3.5 hours. To thicken the sauce, take a ladle of the sauce and whisk it together with the cornstarch in a small sauce pan. Cook on low until the sauce thickens, then throw it back in the slow cooker and stir so that it all combines well. Serve over rice, noodles or mashed potatoes. Garnish with some chopped onions or parsley and some sesame seeds. Although I used a tenderloin, you could use beef top round steak or beef sirloin steak. Stewing beef would also work. No salt is listed as an ingredient in this recipe because I find that the teriyaki sauce and beef broth together provide enough saltiness but if you want, feel free to add more as needed. I love your recipes, this one included, but on this one (“Virginia Says” and) I have to ask, why use the most expensive AND LEAST FLAVORFUL cut of beef in something that will be slow-cooked, rendering ANY cut that is used quite tender? As every beef lover knows, the beef scale runs from tender to flavorful; the more tender the cut, the less flavorful, and vice versa. The only real advantage of beef tenderloin in any application is that it is the extreme on the tender end of the scale. So for something that’s going to cook this long, wouldn’t something like sirloin, round, or even chuck or brisket be just as tender, but provide a lot more beef flavor at significantly lower cost? I understand not wanting to get a bunch of gristle in the meaty bits of the soup, but with most cuts, especially sirloin and eye of round, it’s very easy to spot and remove gristle (usually just one big, obvious streak that’s easy to fillet off using the same method as removing skin from fish with a fillet or boning knife) before cutting the beef into cubes. (And if you put the gristley bits in a cheesecloth bag and add them to the slow-cooker to be easily extracted before serving, they also add a lot of delicious gelatin to the broth that forms.) So if the end result is going to be tender regardless of the cut, for my own tastes and purposes it makes the most sense to spend less and get more flavor in the dish. Your thoughts, please? Hi David! I really have no valid reason for this only that’s what I had in the fridge. As mentioned in the notes though, you could use a less expensive cut of beef as stewing beef.